Dimensions: H: 41" W: 52" D: 52" View Colors Call Us! 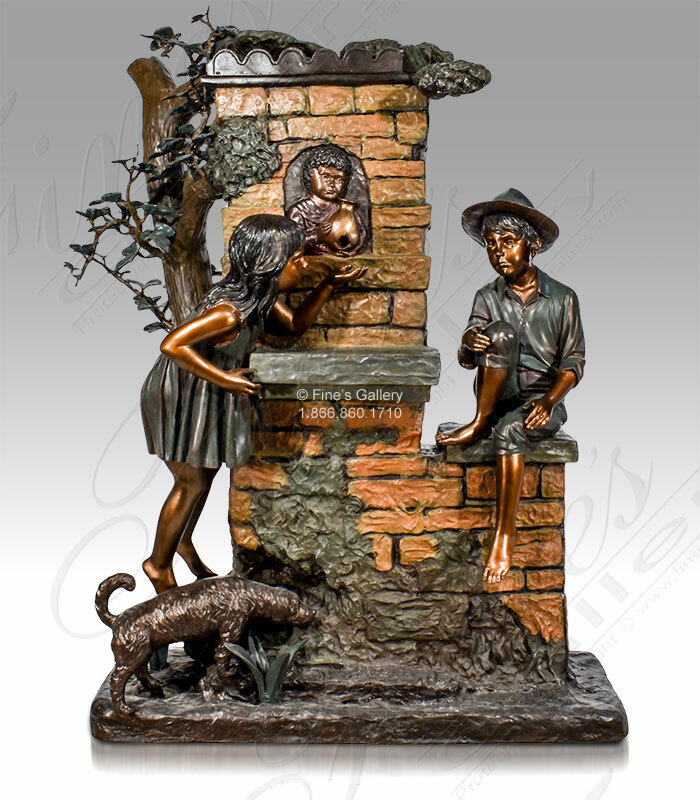 A delightful scene, featuring little Hansel and Gretal-type characters made from green and other color bronzes. 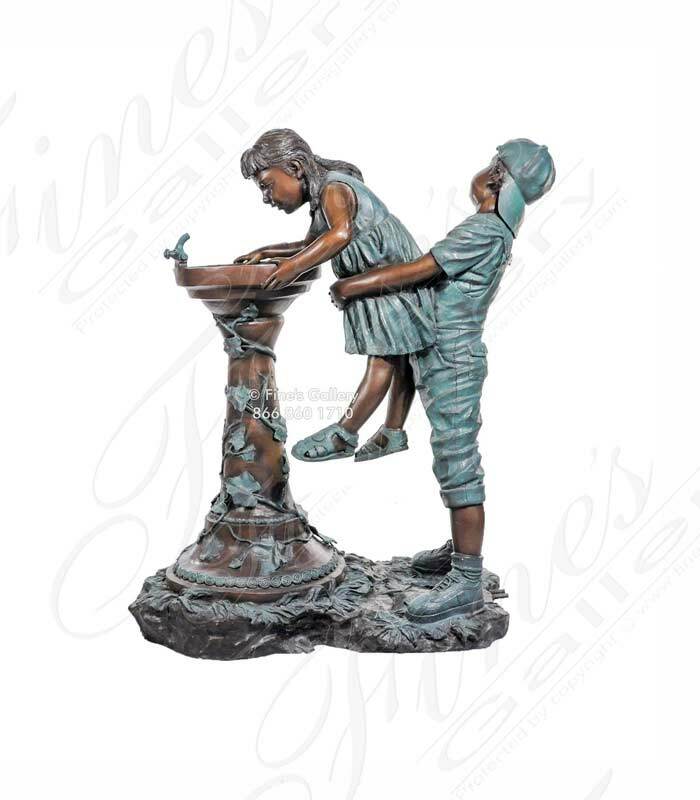 The little girl stands on the boy's back to reach a cherub fountain,as itsprays a waterfall above them and into a small pool. Call us today. Dimensions: H: 77" W: 42" D: 31" View Colors Call Us! Dimensions: H: 63" W: 44" D: 24" View Colors Call Us! 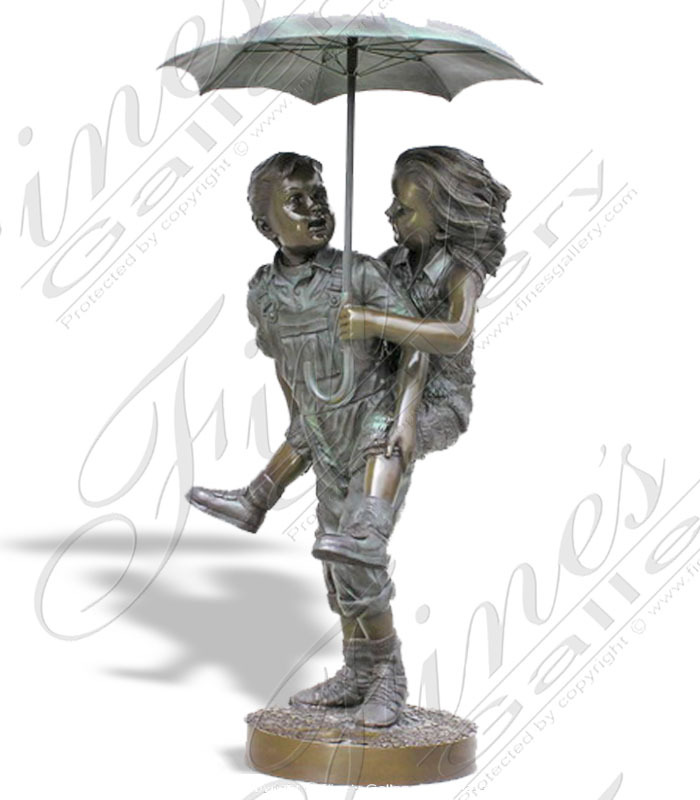 An adorable fountain for you to enjoy in your home, detailing a playful piggyback ride under a large umbrella. 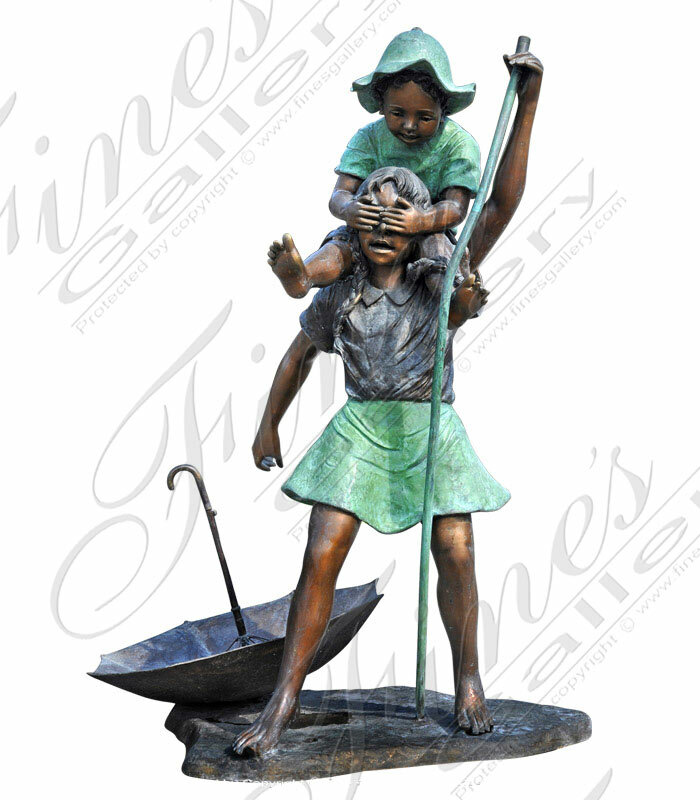 Amazingly realistic portrayal of a young girl and boy made from dark bronze. Contact the gallery today for more details. Dimensions: H: 55" W: 21" D: 28" View Colors Call Us! A boy helps his kid sister up to get a drink from the water fountain. 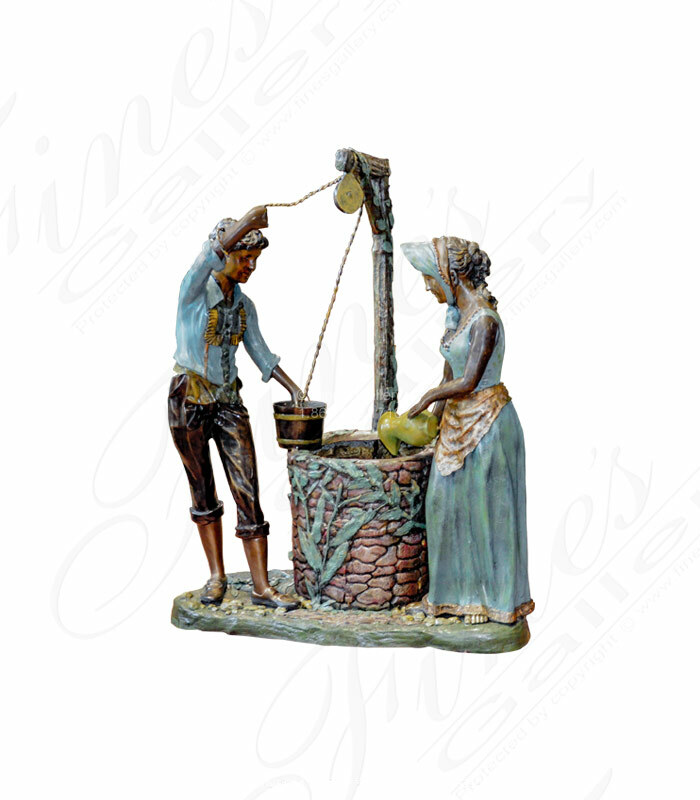 This brilliant bronze fountain is finished in very bright aqua blue and gold. Water spouts from the top of the umbrella. Call us about our matching marble and granite pedestals and pool surrounds. 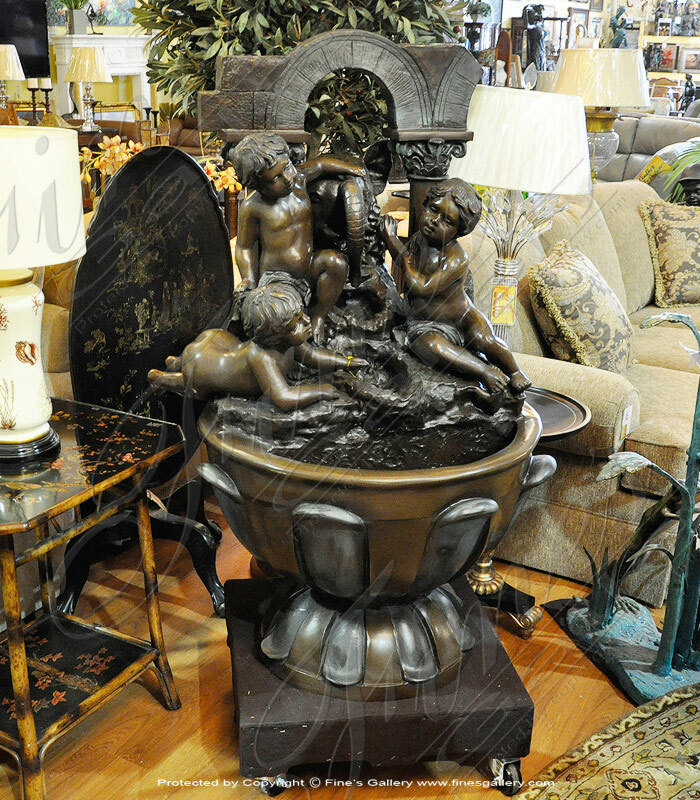 This is a very charming bronze fountain you will enjoy for many years to come! 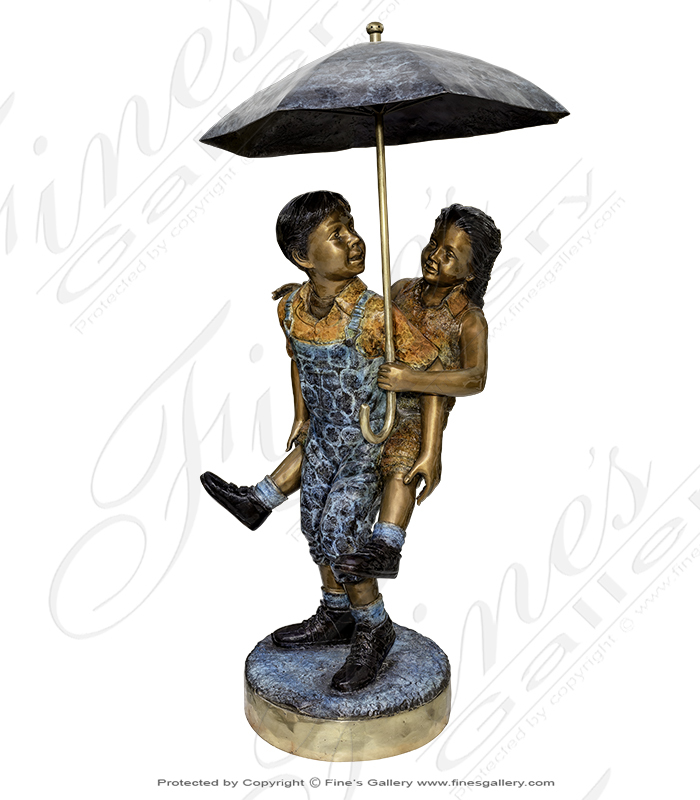 The artist depicts two small children as they share a largeumbrella beneatha stream of rain.Largefountain and small fountain come both in complete patina color only. Dimensions: H: 57" W: 39" D: 39" View Colors Call Us! A truly unique bronze fountain and beautiful piece made from gorgeous bronze! Featuring an elephant fountain, rocky mountainside, three cherubic boys, and elaborate designs with contrasting bronzes. Dimensions: H: 52" W: 33" D: 29" View Colors Call Us! Two children help each other carry a large basket home. Amazing detail in their costumes and expressions, delicately cast from several colors of bronze. 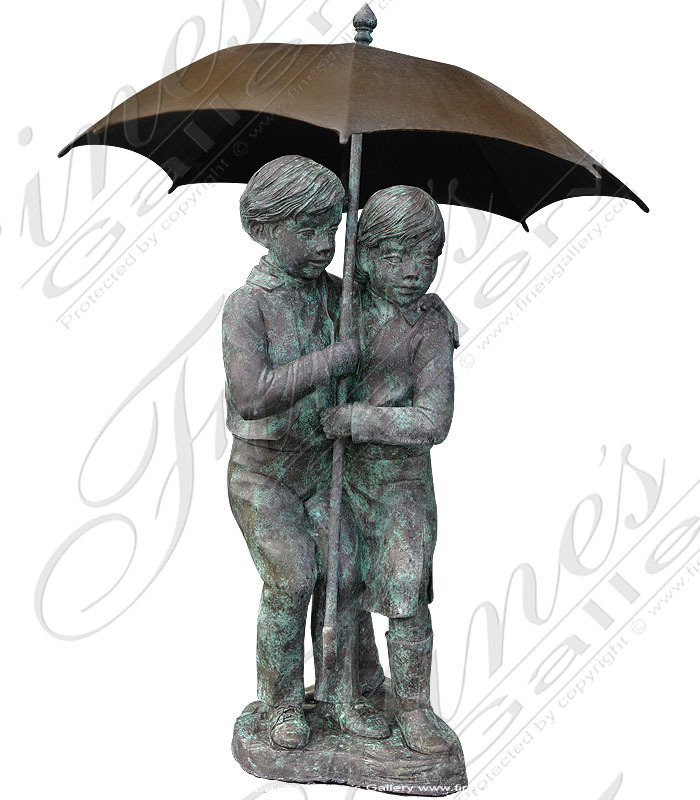 Contact us today for a customized quote on the Two Children Bronze Fountain. Dimensions: H: 59" W: 58" D: 27" View Colors Call Us! 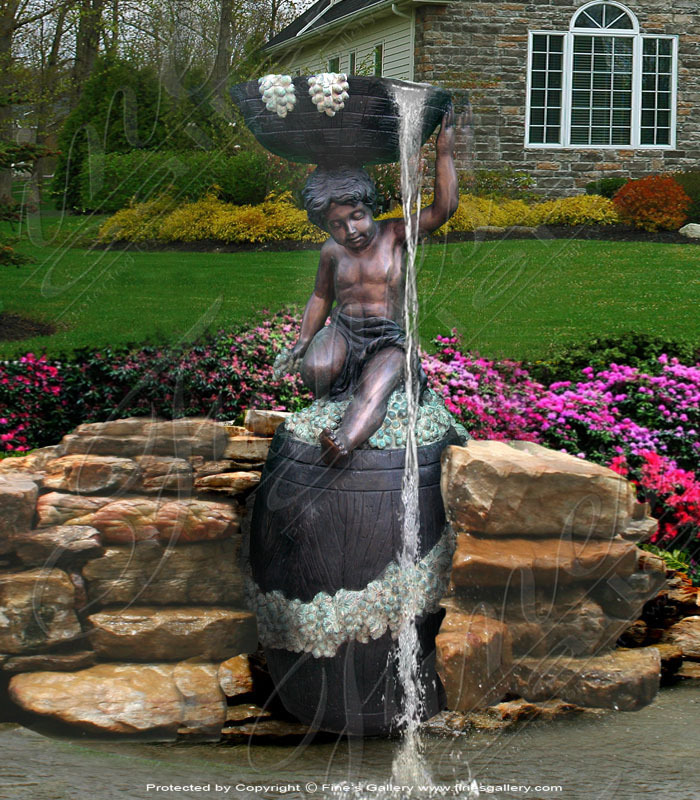 The Vineyard Boy fountain is cast in a light classic bronze with patina coloring. 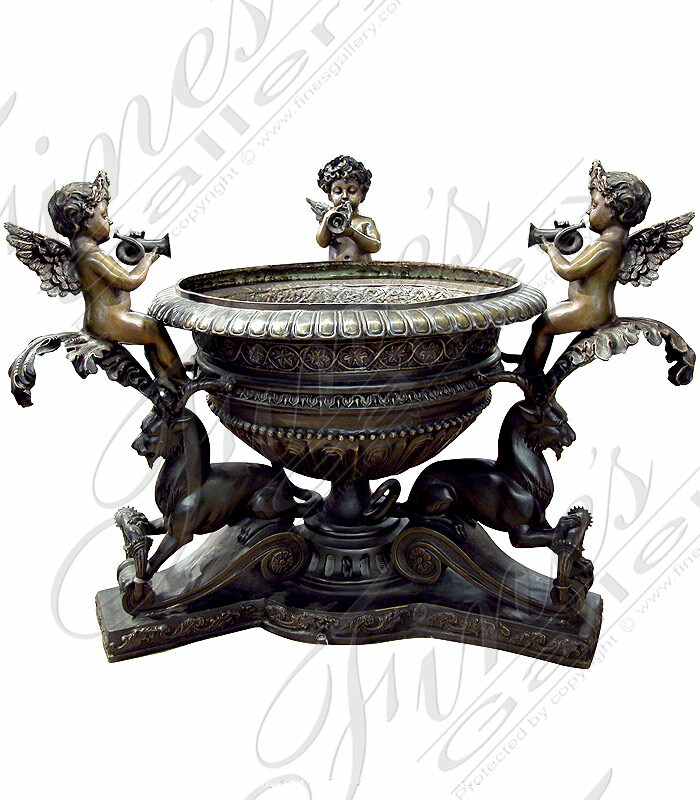 You will enjoy an elaborate show piece with this work of art portraying an adorable cherub holding a large basin on his head. A great addition to any home or yard! Dimensions: H: 65" W: 30" D: 30" View Colors Call Us! This Boy Near the River bronze fountain features a boy next to a tree stump with a fish that spouts water up towards the boy. Dimensions: H: 46" W: 26" D: 19" View Colors Call Us! 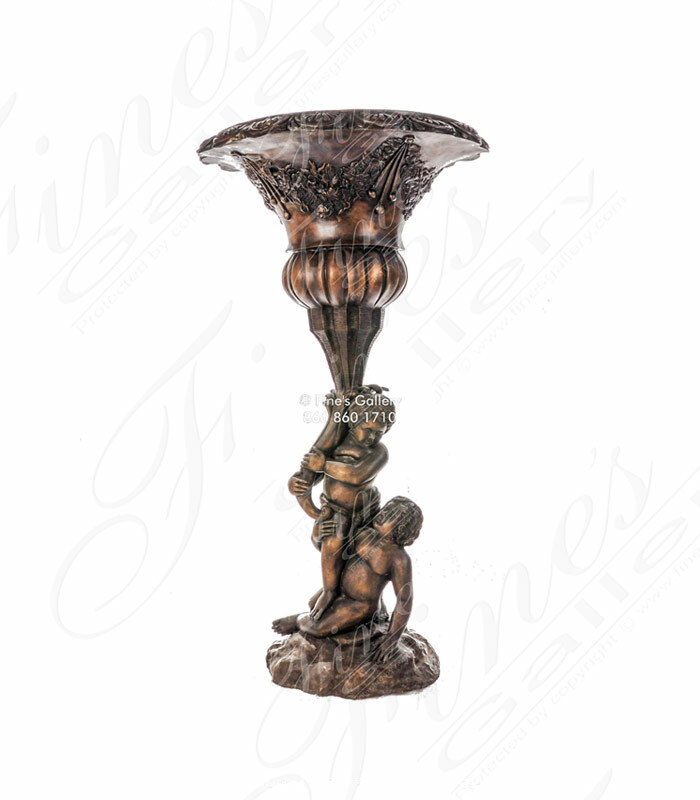 Cast in our classic bronze with patina coloring, this charming bronze fountain will delight you for years to come. Two young children areshownhere playfully having fun. Featuring detailed children, umbrella and more. Contact us today. Dimensions: H: 61" W: 43" D: 36" View Colors Call Us! Truly a great addition to yourhomeor pool area,this malachite colored bronze fountain is cast in gorgeous malachite green light bronze. A wonderful portrayal of a young boy and a mythical ocean creature. Dimensions: H: 57" W: 28.5" D: 31" View Colors Call Us! 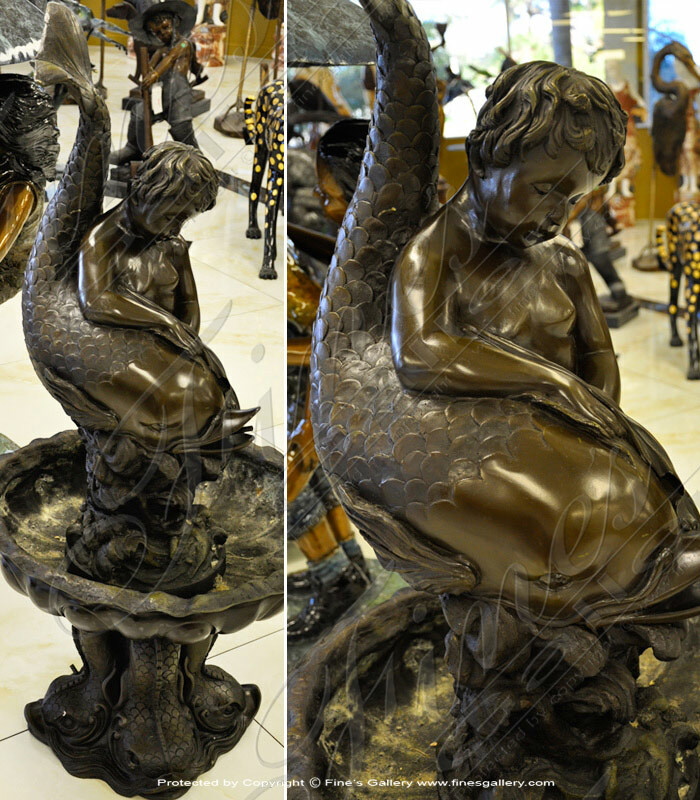 Amazing detail with this beautiful Two Children Bronze Fountain. 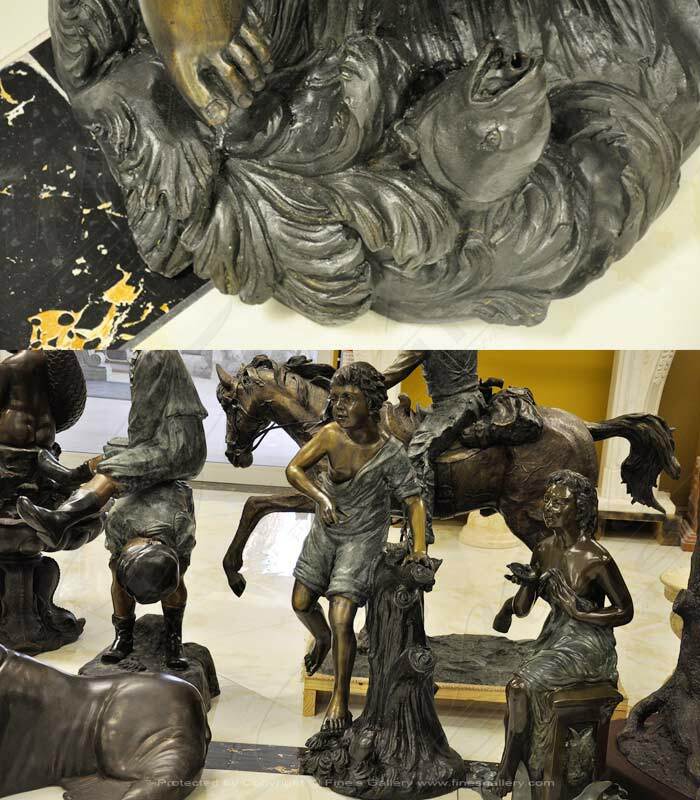 High detailed in beautifully cast bronze. 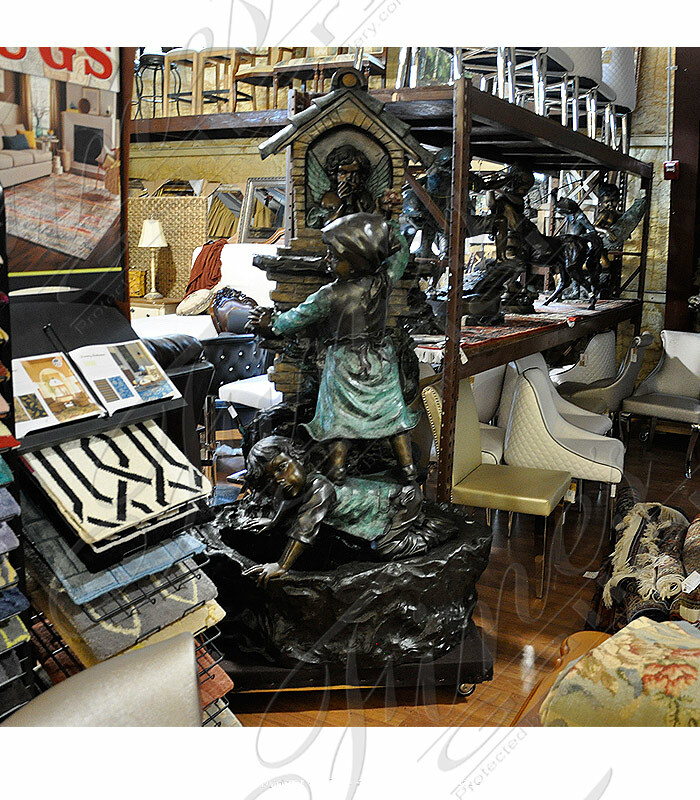 This piece will enhance the beauty and luster to any decor. Call us today for more information on this one of a kind work of art. Dimensions: H: 51" W: 27.75" D: 27.75" View Colors Call Us! A very sweet little cherub pets his large fish friend, whose mouth pours a gentle stream of water into a large elaborate basin. 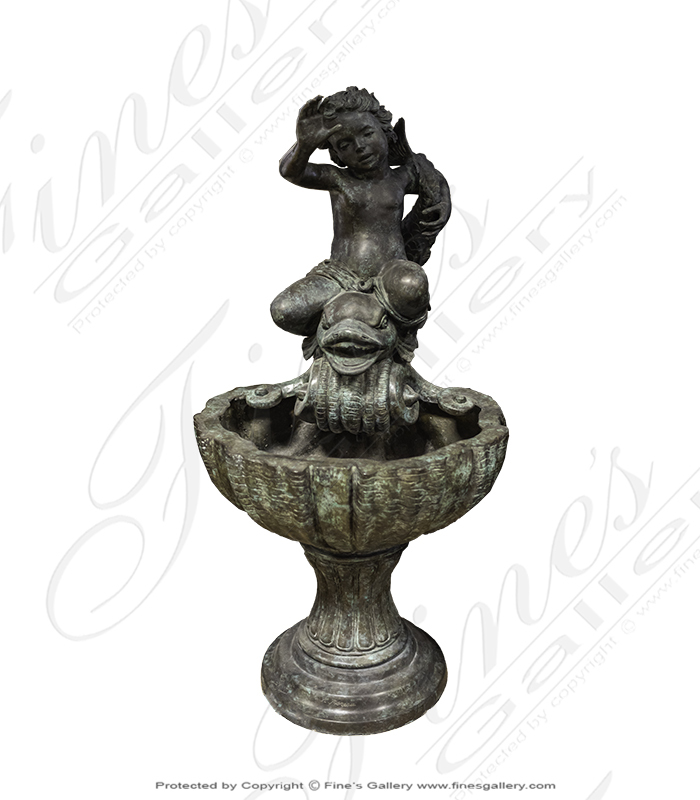 Made from bronze with expert craftsmanship, place this bronze pedestal fountainby itselfor centered inany of our pools. Dimensions: H: 53" W: 26" D: 15" View Colors Call Us!